Death Valley is an amazing place with so much to see! 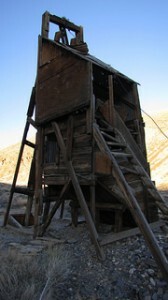 On our 3 day trip to Death Valley National Park, we saw many of the breathtaking landmarks. On the first day, Saturday the 18th, we drove from Bishop, where we had stayed on Friday night. 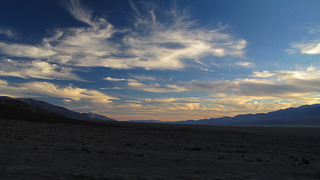 We drove over the mountains to get to Death Valley National Park for most of the day. We stopped at Placer mine, a vertical mine shaft. We went on trail 10S214, and finally branched off into another trail. 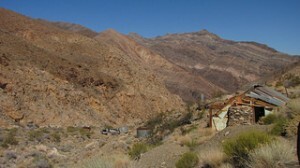 After that, we went down into Saline Valley, visiting the hot springs. 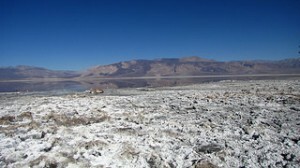 We stopped at the Saline Salt Sea, which was still there but had shrunken greatly, salt covering everything. 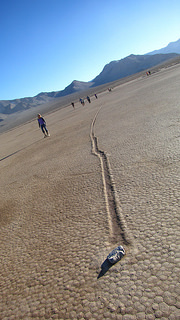 We drove down to Racetrack Playa, a dry lake where rocks move across the lake, resulting in winding trails crisscrossing the lake. Near that was a small place called Teakettle Junction. It was a post where people had hung Teakettles with their names on them. 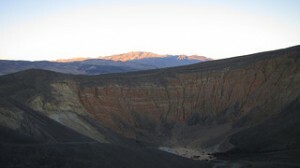 We drove for a while more, and then stopped at Ubehebe Crater. Ubehebe crater is a volcano crater half a mile wide and about 500-777 feet deep, and about 2,000-7,000 years old. We then drove down to the hotel we were staying at for the rest of the trip, Furnace Creek. Furnace Creek is a ranch resort with a hot-spring fed pool, horse stables, multiple restaurants, nice updated rooms, and multiple other accommodations. The next morning, we woke up at around 7:00 and went to Devil’s Golf Course, a large expanse of Halite salt crystal formations that make the ground treacherous and jagged. After that we headed to trail canyon. It took about an hour and a half to get there, but the cliffs around us were breathtaking, and once we got there, I was amazing. A rusty car with shining chrome sat near the side of the road. When you walk up to the top, a garage filled with old, valuable car pieces. A small intact one room cabin sat near the back, a place where you can stay. Down the hill, a larger but more worn house sat. After we got out of the canyon, we went down to Badwater. Despite its name, the water is only salty. Wildlife still thrives though, Badwater is home to pickleweed; an aquatic plant, aquatic insects, and the threatened Badwater snail. Near the pool and all around are salt crusts that have formed into hexagonal honeycomb shapes by freeze-thaw cycles. A short drive later, and we were at Artist’s drive, a small canyon filled with colors. The rock around us was green, brown, white and pink, like Neapolitan ice cream. Then, we drove to Mustard Canyon. It is a small canyon, the color of mustard, naturally. After our long day, we went back to Furnace Creek. The next and final day, we woke up at about 9:00. We went to go visit Mustard Canyon again in the daylight, then headed to Rhyolitte. Rhyolitte was a mining town that eventually died out, like most of them. Multiple buildings still stand. After that, we headed over to Titus Canyon. 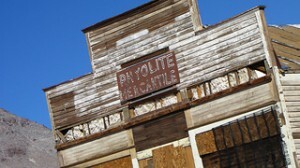 On the way to it, we stopped at Leadfield, a mining town that only lived for about 3 months. 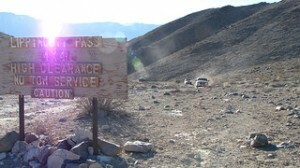 Then, we drove into Titus Canyon. 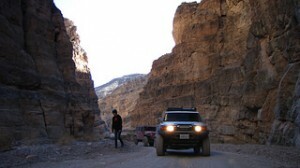 Titus canyon is a gorgeous, long gorge with breathtakingly high cliffs and amazing sights. Some of the rocks in Titus Canyon are 570–505 million years old. The first three fourths are amazing, but the real beauty is in the last few miles. At the end, it turns into a slot canyon with sheer vertical cliffs rising from only about one foot off the side of the road. Near the end as well, some megabreccia can be found. Breccia is a rock composed of broken fragments of rock held together by something called matrix, or groundmass. After we finished up that, we started our long journey home. Editor’s Note: This article is published un-edited. If you would like more information, feel free to contact us via the contact us link above. We welcome user submitted articles from all ages, please share your stories with us! 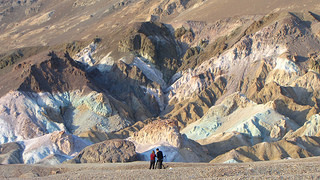 For more information on Death Valley National Park, please visit the NPS website. 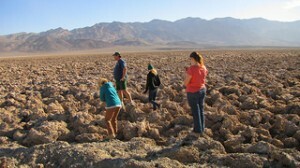 There are hotel, cabin and campgrounds available in Furnace Creek and in Stove Pipe Wells. February 13, 2011 -- Transfer Flow to the Rescue!